7 questions you need to ask before considering this type of loan. A reverse mortgage is a loan that enables homeowners – who are generally 62 years of age or older – to use part of their home’s equity to obtain cash proceeds that can be used to pay for property taxes or insurance, home renovations, or medical and daily living expenses that help them age-in-place. This type of loan does not have to be repaid until the last surviving borrower or remaining eligible non-borrowing spouse passes away or permanently leaves the home, or if the homeowners sell the home or fail to meet the loan obligations. If a reverse mortgage is something you or your aging parents are considering, like any financial product, there are things to consider carefully before deciding whether to obtain one. The National Reverse Mortgage Lenders Association (NRMLA) has created a Reverse Mortgage Self-Evaluation Checklist to help families better understand what this type of loan is and determine if it’s right for them. How do you intend to use your reverse mortgage loan proceeds? From modifying your home to meeting the physical needs of getting older to delaying Social Security payments, there are many reasons why someone would obtain a reverse mortgage. Do you fully understand your obligations as a borrower under a reverse mortgage? There are specific obligations the reverse mortgage borrower must meet, including staying current on property taxes, home insurance, and HOA fees. If married, will your spouse be a co-borrower of your loan? If your spouse will be a co-borrower, or an eligible or ineligible non-borrowing partner, there are specific requirements and criteria for maintaining and repaying the loan that you will need to know. 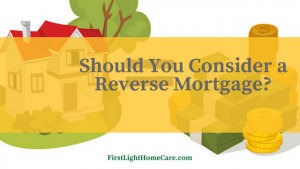 How will your reverse mortgage loan be repaid? A reverse mortgage is a non-recourse loan, which means that the borrower or the borrower’s estate will never be obligated to pay the lender more than the loan balance or the current value of the home, whichever is less. There are different ways the loan can be repaid, and it is important to understand them all. Do you receive assistance under any government programs that are based on your current income? A reverse mortgage does not affect regular Social Security or Medicare benefits. However, if you are on Medicaid or receive Supplemental Security Income (SSI), reverse mortgage proceeds may affect your benefits. How long do you and your spouse plan to remain in your home? Whether you’re going to live in your home for the next 20 years or just a few years, you need to fully understand the financial impact of your reverse mortgage. Consider this carefully with your HUD-approved reverse mortgage counselor and determine if there are more cost-effective alternative strategies. Have you considered other strategies to supplement your retirement income? During reverse mortgage counseling, you may uncover that you might be eligible for grant money or other financial assistance, such as housing assistance, tax deferral programs, home repair grants or loans, food stamps, fuel assistance, social services or healthcare. For more detailed information, click to view and print this Reverse Mortgage Self-Evaluation: A Checklist of Key Considerations, courtesy of the National Reverse Mortgage Lenders Association. Have you considered a reverse mortgage to help you or a loved one age in place? Comment here or join the conversation on our Facebook page.